In the trailer released Wednesday, Sabrina just can’t go through with becoming a full witch with her dark baptism … but that doesn’t seem to stop her from using her powers. 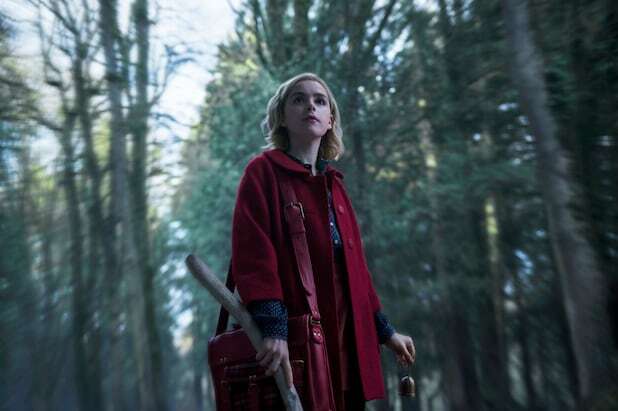 The first teaser was released last month, setting the stage for the first season: it’s Sabrina Spellman’s 16th birthday, and she must decide whether to embrace her mortal or witch side. The series, which is based on the comics series by Roberto Aguirre-Sacasa, will debut on Oct. 26, just in time for Halloween, the streaming service previously announced. Aguirre-Sacasa has been leaving fans little crumbs throughout the production process, previously sharing the first teaser, and a photo at the table read for Episode 9 that included Ross Lynch, who plays Sabrina’s boyfriend Harvey, and co-star Chance Perdomo, who plays Sabrina’s cousin Ambrose. He also previously shared a photo of Lynch and Shipka on set as the teen couple, and of course, before that, a photo of Salem himself (but don’t expect a talking cat in this series). “Chilling Adventures” stars Shipka, Lynch and Perdomo along with Richard Coyle as Father Blackwood, Lucy Davis as Aunt Hilda, Miranda Otto as Aunt Zelda, Tati Gabrielle as Prudence and Michelle Gomez as Mary Wardell. Aguirre-Sacasa executive produces the Warner Bros. Television production, along with Greg Berlanti and Sarah Schechter of Berlanti Productions, Archie Comics CEO Jon Goldwater and director Lee Toland Krieger.